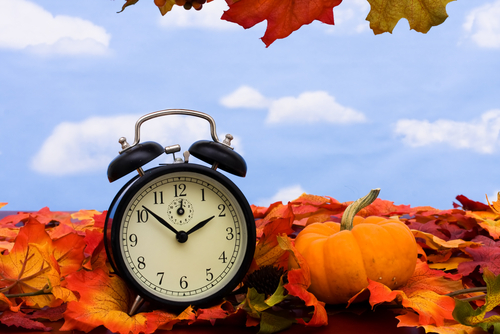 Here’s your official reminder: this weekend is the end of daylight savings time (DST). Don’t worry, it’s the cool time change – the one where we (incredibly!) go back in time. Not it’s wicked, sleep depriving step-sister, spring ahead. Before heading to bed on Saturday, put your clocks back one hour. Or at least adjust the old-fashioned widgets that won’t adjust themselves. In a past, child-free existence, the end of daylight savings time was an occasion to be celebrated. Fall Back meant one extra hour dedicated to the guilty pleasure of your choice. But in your present, kid-centric world, the end of daylight savings time is just one more obstacle to navigate. Fortunately, Fall Back doesn’t have to be a significant setback. If your child generally has good sleep habits, is well rested and has shown their ability to go with the flow, don’t be too concerned. You may not have to do anything ahead of the time change. Give them a few days, and they’ll adjust. For parents of children who have proven themselves to be more sensitive in terms of scheduling and sleep, here are a few suggestions to make it easy on them (aka easy on you). Plan – Start adjusting the week prior to the time change. For children heading to school, if you can, consider shifting their moring rising, breakfast, dinner, and bedtimes to be 15 minutes later. For children who are younger than school age, consider shifting their entire schedule (including wake times, eating times, nap(s) and bedtimes) 15 minutes later. Repeat this incremental shift for the next 3 days. By the time Sunday rolls around, their little bodies are fully prepared for the adjustment. Stay on Schedule – Every aspect of the day gives our children an opportunity to know what time it is. Mealtimes, playtimes, along with wake and bedtimes all offer cues to help our children be prepared and receptive for what’s coming next. Be mindful and deliberate with the time adjustment as it affects ALL of your daily activities, not just sleep. Diligently follow your usual routines on the adjusted schedule. Earlier Bedtimes – On the day of and days following the time change, you may notice that a 7 AM wake time turns into a 6 AM wake time. Be prepared to compensate with an earlier bedtime (and possibly earlier nap times for the wee ones) to prevent any overtiredness from setting in. Let There Be Light – The onset of autumn means cooler, shorter days with fewer hours of sunlight. In the mornings, you’re likely turning on the lights anyway. As your child is having their breakfast, ensure exposure to a well-lit area of your home. Try to keep things dark until then. Build in some time for outdoor play during the day on Sunday as well. This will help naturally regulate circadian rhythms, but exercise will also boost sleep quality and your child’s ability to settle at naps and bedtime. Admit to yourself that it’s not always going to be perfect. Don’t sweat it. Children take some time to adjust and adapt, just like you. Be patient and consistent while continuing to make sleep a priority for your family. 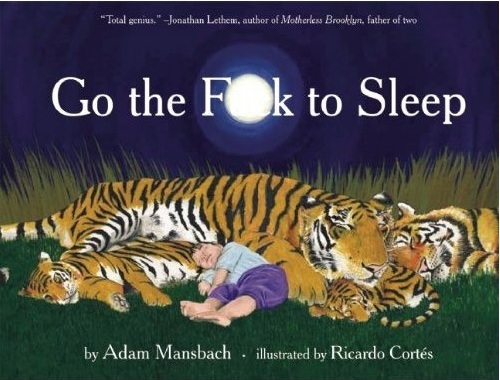 Go the F* to Sleep didn’t become a number 1 bestseller because all of our kids are sleeping through the night and taking long restful naps. This book offers an honest and cheeky look at the frustration and desperation EVERY parent has experienced at one time or another: your baby can’t or won’t sleep and you find yourself swearing under your breath. You know they’re tired. But what’s keeping them up? Sleep Environment – A child’s bedroom can make or break their ability to drift off to sleep. Whatever place you do choose for your child to sleep, be consistent. Encourage soothing and restfulness by having a dark, quiet space. Limit the intrusion of sunlight with blackout curtains or blinds. We love these inexpensive, easy blackout shades from the Home Depot. Overtired – Wrangling an overtired child into bed is an uphill battle. There is a point where children who are overtired can appear to be wired or hyper. Aim to get them in bed drowsy but before overtiredness sets in. Be respectful of your child’s limits. Under-tired – If a child has rested too long during the day or has not slept at biologically appropriate times, your child simply may not be ready to rest. Help them be successful at transitioning to sleep by winding down and offering a soothing bedtime routine, like stories, snuggles and lullabies. Jobs – We all have our jobs to do. So do our children. A baby might have a job to call for you to see if you’ll come put her soother back in her mouth. A toddler might need to check if you’re still lying next to him like you were when he fell asleep. A preschooler might believe there are monsters under his bed and need your magic spells to eradicate them. Do your best to ensure sleep is the only job your child has. Having awareness and avoiding these situations will help create ideal circumstances for your child to have calm naps and peaceful nights; no cussing necessary. Quiet Time doesn’t need to be complicated. Something your child would usually enjoy out of their room can be easily repackaged as a special quiet time activity. 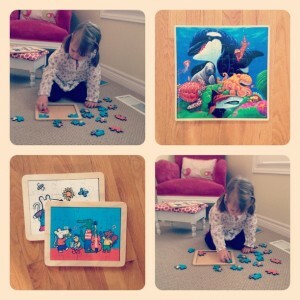 We like puzzles that our child has been successful with in the past. Ensuring an activity your child can do independently and successfully is key! Wander over to Pinterest for some more Quiet Time Inspiration.